This book tells how Phil Knight began his business with a simple idea for a better running shoe and how it developed into the massive global company it is today. Focusing on the marketing and the innovative concepts that built the Nike empire, this story explains how a business can use good branding, endorsements, and an understanding of the needs of their customers in order to succeed. I really enjoyed reading this book! It is written for young children, so many business concepts that a child wouldn’t know like “Revenue,” Investments,” or “Board of Directors” are explained with definitions for the bigger words. There are also “Fun Fact” boxes within the text that give extra tidbits of information about how the Nike company was built. There are funny anecdotes about how the company received its name, designed the classic Swoosh logo, and developed its rapport with athletes, then began reaching out to pros for endorsement deals. I was interested to see that the book includes the history of Nike’s endorsement deals with athletes who later embarrassed the company by using illegal steroids (Lance Armstrong) or whose personal lives were less than stellar (Tiger Woods). 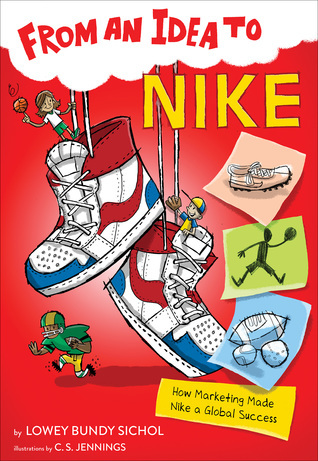 The book briefly states how Nike dealt with those situations and weathered the storms, but it doesn’t go into details. However, there is no mention of the current Nike controversy with Colin Kaepernick and his inflammatory political demonstrations. (Bad move there, Nike. You would think that a good business plan would include staying away from politics, because you always end up offending half your customers. But it’s not mentioned in this book.) There is also an entire chapter about Tiger Woods, and I got bored reading about how many championships he won wearing Nike shoes, and Nike shirts, and using Nike golf balls.